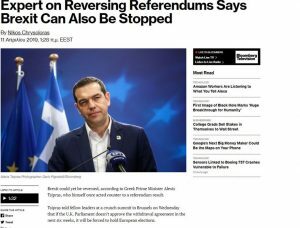 Using the derogatory title “Expert on Reversing Referendums Says Brexit Can Also Be Stopped” in reference to Greek PM Alexis Tsipras, Bloomberg claims Mr Tsipras floated the idea that Brexit could be reversed during the EU Summit meeting on Wednesday. Tsipras told fellow leaders at a crunch summit in Brussels on Wednesday that if the U.K. Parliament doesn’t approve the withdrawal agreement in the next six weeks, it will be forced to hold European elections. 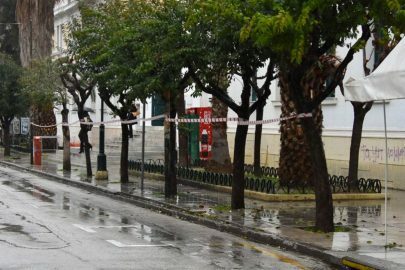 Tsipras knows a thing or two about annulling referendum results. He called a popular vote on a deal Greece was offered by its European partners in 2015 and campaigned against it. He won the plebiscite only to reverse course and accept the deal at an all-night summit in Brussels.